The question you might ask is, why would I write such an article? I have invented and marketed the Gold Coin Balance™, a product that tests 7 different one-ounce gold coins. I had to research counterfeit coins in order to develop the Gold Coin Balance. Why one-ounce coins only? Because, they are far and away the predominant size purchased, accounting for 85% of market sales. Why do so many people buy gold coins? Because they are made from pure gold or in the case of Eagles and Krugerrands, a mix of 10% copper and 90% gold. The delicate surface image of a coin requires a 10 ton stamping machine to create the fine detail that aids in identification. Gold bars, because they are forged and then stamped using a simple stamping machine, lack detail and are more easily faked. The Gold Coin Balance checks the diameter, thickness and weight of a coin to make sure the coin is not counterfeit. Today’s fake coins are made of lead and copper that weigh 30% less than a real gold coin. These fakes can easily be detected by the Gold Coin Balance. 1. Now, to answer the question of “How to make the perfect fake gold coin.” The substitute metals that would allow the fake to be the same size and weight of the real thing are uranium, plutonium and tungsten. Considering cost and danger, only tungsten meets the criteria of the perfect substitute. It is cheap and weighs almost the same as gold. The difference is that it is very brittle, so it cannot be stamped to create the face detail. Any perfect fake would require a thick gold-plated surface to be stamped. This would allow for the fine detail of the image to be exactly like a real coin. 2. Next, we need to choose which coin to fake. The copper/gold mix coins are the best since they allow the mix of gold and copper in the overplating process. 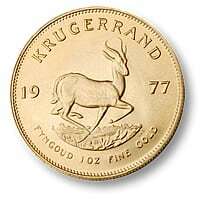 The Krugerrand is the thickest and best target coin. 3. The next step is to create a “slug” or a round tungsten 20% smaller than the coin itself. Then, plate it with a gold and copper mix that can be stamped with the image. The result is the only coin that will fool the Gold Coin Balance. Nothing else can do so! The world is full of counterfeiters of one hundred dollar bills and sometimes it is often rogue governments who have the tools to do so. It would not surprise me if a rogue government chose to make coins with tungsten inside given the high price and profitability of one gold coin. So, the next question is how can you detect a gold-plated tungsten coin? It is not easy. The surface acid test or even an electrical conduction test will pass through the plated surface and not reveal the tungsten inside. Both China and Ethiopia have been fooled by tungsten-loaded gold bars. Is there some other sure test? Tungsten is very, very hard. Long ago, a man named Leeb developed a method to test metal without drilling a hole into it. Imagine throwing a hard ball at a wood surface at a fixed speed. It would bounce back at a certain speed/distance. Throw the same hard ball at plate steel and the return of speed/distance is very different. A Leeb gage does the same thing. They sell for $400-$1,000 and are not simple like the Gold Coin Balance. As far as we know to date, no gold coins have been found that have a tungsten core*. Although there is a Chinese company that makes and sells commemorative coins that have a tungsten core. will be easy to cash for food and shelter. and hence filled with tungsten and not a solid gold coin. Once such a simple tester is available, it prevents the counterfeiter from going to the expense to make fake coins. UPDATE: 2014-02-06 Goldcoinbalance.com has discovered a fake gold eagle one oz that passes the tests for weight, size and thickness. Henceforth, we can no longer guarantee Eagles or Kruggerrands that pass the three Gold Coin Balance tests. Here is a photo of the fake coin, we have filed the edge to expose the core of Tungsten. If you look closely at this photo there was a slight bubble and color is off. The ring test also is a giveaway. Someone is using a Tungsten core to create the fake American Gold Eagles. It had been believed that Tungsten, although the right weight to create a fake gold coin, would be too brittle to stamp.